Hi! I just wanted to say that I really liked this post! Thanks for putting this out there… It was so cool to read something and have it be like someone is inside my head. It’s such a relief in a way, to know that I can be ‘bisexual’ without having to be part of some ‘gold standard.’ I’ve always thought of sexuality as a spectrum! Thanks for sharing your thoughts, I’m so glad you found the post useful. 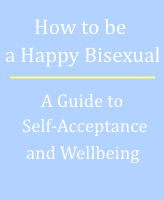 It can be really liberating to let go of the idea that there’s a ‘right’ way to be bisexual. Good luck!